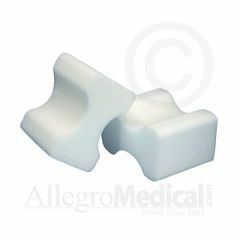 AllegroMedical.com offers a wide array of premium and high quality leg wedge pillows, knee wedge pillow products, and leg spacers & rests. Because there are so many different needs with bed positioners and wedges, the assortment of leg wedge pillows varies widely, and includes some of the best-known brands such as NYOrtho, DMI, Astar, Comfort Bed, AliMed and many others. You will find premium knee wedge pillow options in addition to a diversity of leg spacers & leg rests in all sizes, and designs. AllegroMedical.com offers the very finest leg and knee wedge pillow products as well as accessories like leg spacers and rests at the lowest prices guaranteed. See our Best Price Guarantee for more details. Comfort Bed Wedge - 32" x 26" x 5"